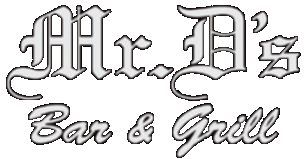 Breakfast at Mr. D's Saturday and Sunday's 10am to 12pm. Friday - Fish Fry served 11 am to 9pm. Get 4 huge pieces of pollock with fries and slaw for only $10.95! Beverage purchase is required with all specials. Dine in only. Click on any event below or read the details! 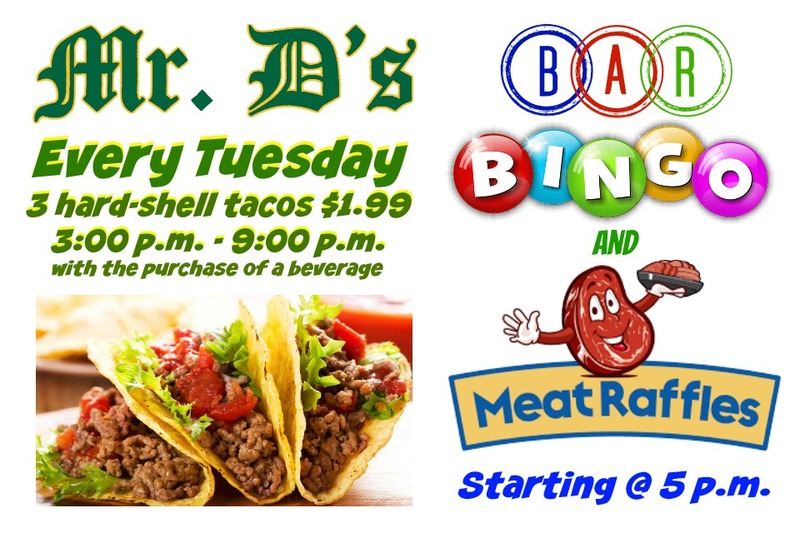 Join us every Tuesday for Bar BINGO and our Meat Raffle! Plus, three hard shell tacos are just $1.99 with the purchase of a beverage! 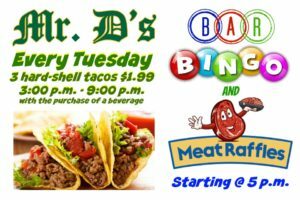 BINGO & the Meat Raffle is hosted by the Irving Community Club (Lic. #02305). They generously donate to a number of area organizations serving youth, such as the Valley Youth Center and the Boys and Girls club to name just a few. Tempted Fate returns to Mr. D’s April 5th and April 6th! They’re bringing their high energy mix of 80’s rock. 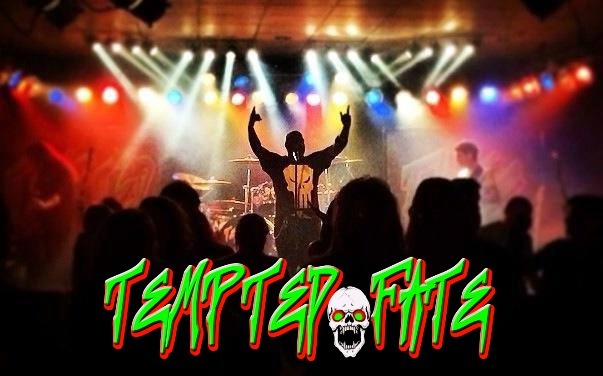 Tempted Fate is: Mark Kinder – Guitar, Red Beard – Vocals, Mike Thorene – Bass, Paul Johnson – Drums, Paul Michelizzi – Sound and Tofa Tuinei Jr. – Lighting. The Burning Verns list their influences as: The Beatles, The Doors, Deer Tick, The Avett Brothers, Johnny Cash, C.C.R., Mason Jennings, The Eagles, Old Crow Medicine Show, John Denver, and The Band. 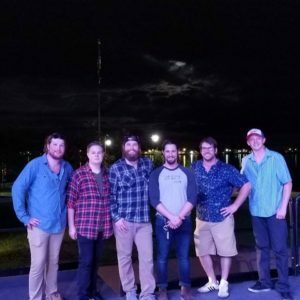 AfterShock is a five piece cover band from Duluth, MN. Their diverse catalog spans from 70s classic rock through contemporary top 40. Come ready to ROCK and dance the night away to songs from some of the Best 80s bands such as Bon Jovi, Def Leppard, Foreigner, Motley Crue, Pink Floyd, Metallica, Queen, Poison and many other legendary 80s Rock Bands!!! You won’t want to miss this show. 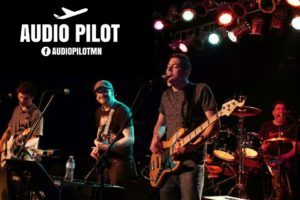 Audio Pilot band members include four talented young guys and one old man. They are Luke Nyen, Cody Schuman, Rick Turk, Joe Fosle, and Jay Fosle. 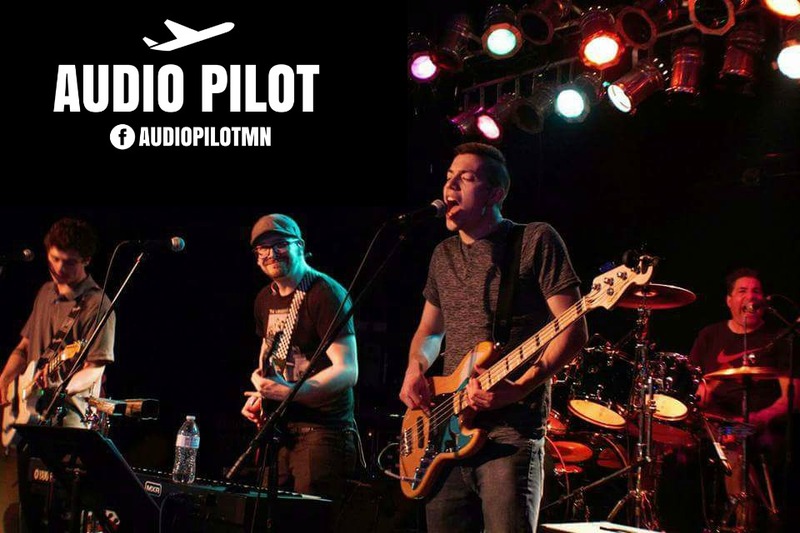 You’re sure to enjoy Audio Pilot’s eclectic mix of classic and contemporary rock n roll.